Bondarzewia mesenterica (Schaeff.) Kreisel is a large beautiful and rare fungus that fruits in the Pacific Northwest. Misunderstandings remain, as some authors continue to call it B. montana and some wild mushroom sellers label it “wild maitake.” Strangely, it has also been called a Lactarius and mycorrhizal. DNA was extracted and analyzed to confirm its position in the Russulales. Bondarzewia mesenterica, in the family Bondarzewiaceae, is closer to Echinodontium and Hericium than to Lactarius in the mycorrhizal Russulaceae. Globally, the genus Bondarzewia includes four described species, each causing a white rot in geographically separated forest types. To confirm its saprotrophic nutritional strategy, a culture from a wild specimen was grown in laboratory conditions. Fruiting structures developed on sterile woody substrates. Cultivated Bondarzewia mesenterica is palatable and robust, with potential culinary value. This fungus remains underexplored by mycomedicinal prospecting and culinary markets; further investigation is needed to determine its actual culinary value and optimum conditions for fruiting. September, at an outdoor market in southern Oregon, a curious sight caught my attention: upon a table full of gourmet mushrooms including chanterelles, matsutake and porcini, a large bouquet of light brown fronds was labeled, “wild maitake.” When I inquired, the seller, an experienced local mushroom collector, assured me that this was indeed maitake. But this was not maitake, also known as hen of the woods or Grifola frondosa, a flavorful and healthful saprotrophic mushroom that fruits under oaks in late summer and fall throughout the greater Appalachian region. This was the grand and relatively rare, Bondarzewia mesenterica, collected in the remnant giant forests of the Pacific Northwest. Rolf Singer (1940) named the genus in honor of Apollinaris Semenovich Bondartsev (1877–1968), the Russian specialist on pathogenic and wood decay polypores. A glorious and rare sight in the wild, Bondarzewia remains slightly misunderstood. In a recent issue of Mushroom: the Journal of Wild Mushrooming, Leon Shernoff (2009) explains that Bondarzewia can be mistaken for maitake but that it is mycorrhizal and “actually a Lactarius.” However, it is neither mycorrhizal nor a Lactarius. Disagreement remains even among authors regarding its scientific name, as some call it by its more familiar synonymous name Bondarzewia montana, which was originally used by Singer. Here, I use Bondarzewia mesenterica as is in some literature and web sites (e.g., MycoBank.org and MycoKey.org. Originally described in 1774 as Boletus mesentericus Schaeffer, after several oscillations of epithets, it was classified in 1984 as Bondarzewia mesenterica (Schaeff.) Kreisel. Adding to the confusion, some recent major publications have retained the alternate nomenclature. Epitomizing this enigma, Miller et al. (2006) use both: B. montana in the phylogenetic tree and B. mesenterica in the text. Consumers and markets may tolerate and even prefer ambiguous common names that are easier to remember or evocative of pleasant, familiar and delicious memories. Science, however, seeks to avoid variation among societies, dialects and regions. The science of naming and classifying organisms is called systematics and ultimately strives to characterize individual species and to organize them in groups based on similarities and differences. Because many people eat mushrooms, it is critical to be certain of identifications. With such potent sources of foods and medicines as fungi, the consequences of ambiguity could be lethal. Eventually markets, by functioning to serve the best interest of consumers or through regulation, must adhere to scientific distinctions and clarifications. Fortunately in this case, the misnamed maitake, B. mesenterica, is also edible. Although Arora (1986) describes it as bitter and tough, naturalists are known to enjoy young specimens. I cooked and consumed some of this wild maitake lookalike, and found it palatable and firm. To confirm its identity, I examined the specimen under a microscope, and also sequenced a small portion of its DNA, the ITS region, known as its “fingerprint” or “barcode.” Then, I generated a culture, which produced initial fruiting structures, and finally I tasted the cultivated Bondarzewia raw and cooked. Raw samples (not ingested) were “peppery” to the palate; cooked they were tender and pleasant. Fig. 1 Bondarzewia mesenterica at the Yachats Mushroom Festival Oct 2009. Fig 2-4 B. mesenterica from southern Oregon: pore surface, cross section and top surface. In the wild, Bondarzewia mesenterica fruiting bodies fan out in large undulating semi-circular fronds, its fuzzy surface zoned with many shades of brown (Fig 1). The pore layer below is thick (2-3mm), with pores irregularly shaped and soft, in texture resembling the russuloid gills to which they are related (Figs 2 - 4). The pore layer of Bondarzewia is deeper, more elongated and angular than that of Grifola frondosa which has a thinner (1-2mm) pore layer, and smaller, more tightly organized, pores. Most obviously, Grifola frondosa forms more numerous, smaller and drab grey-brown fronds, 2-6 cm across (Fig 5), while Bondarzewia forms fewer large fronds, 7-12 cm across, in more colorful shades of brown with tinges of purple and orange. Under the microscope, Bondarzewia spores are round with distinctive amyloid ornamentation (darkening to purple when stained with iodine) unlike the oval, smooth spores of the true maitake, Grifola frondosa. While still considered a "polypore" macromorphologically, because its spore producing underside resembles pores, evolutionarily Bondarzewia is in the Russulales (Miller et al 2006). 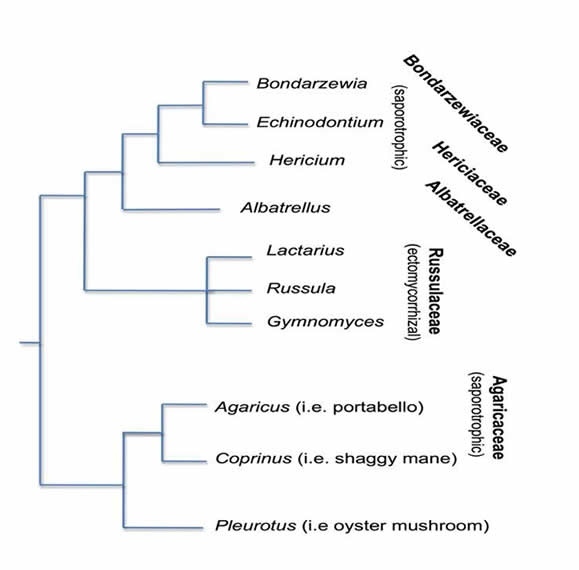 In the Russulales, Bondarzewia is the sole genus in the family, Bondarzewiaceae, nearer to Hericium (the lion’s mane) in the family Hericiaceae than to Lactarius in the mycorrhizal Russulaceae (Fig. 5b). The study of mycology is presently in an active phase of discovery and reassessment as DNA reveals relationships that mycologists could not previously fathom based only on morphology and chemical reactions. The DNA fingerprint generated, unambiguously confirmed the identity of this mushroom, although the matching sequence in GenBank (the online genetic database), deposited by the AFTOL (Assembling the Fungal Tree of Life) project is labeled B. montana. Fig 5b. Conceptual phylogenetic tree showing the position of Bondarzewia relative to other genera in the Russulales and the Agaricales, based on Miller et al (2006). Geographically, in North America B. mesenterica fruits only in the Pacific Northwest (Washington, Oregon, northern California, Idaho), British Columbia and western Montana. Bondarzewia mesenterica was originally described from Europe, where it is rare. More genetic analysis will show whether the North American and European B. mesenterica are conspecific. If not, stay tuned for yet another nomenclatural twist. In the midwestern and eastern United States, Berkeley’s Polypore, Bondarzewia berkeleyi, fruits at the base of hardwoods and is also collected and consumed by naturalists and amateur mycologists. In addition to these North American Bondarzewia, two other species have been described: one from South America, Bondarzewia guaitecasensis, growing on Nothofagus trees (Singer 1953, 1964) and another from tropical China, the recently described Bondarzewia podocarpi, growing on Podocarpus trees (Dai et al. 2010). DNA studies show the two North American species more closely related to each other than to either the Asian or South American species. Each species of Bondarzewia grows in separate forest types and causes aggressive white rot (Gilbertson and Ryvarden 1986, Trudell and Ammirati 2009). To observe the growing mycelium and to determine if it could fruit in vitro, a pure culture of Bondarzewia mesenterica was isolated from interior tissue using published methods (Gilbertson and Ryvarden 1986, Stamets and Chilton 1983, Stamets 1993). The, isolates grew well on malt yeast agar, readily transferring onto sterilized grain and woody substrates — a mixture of sawdust and woodchips comprised of alder (Alnus rubra), maple (Acer macrophyllum), oak (Quercus kellogii) and Douglas fir (Pseudotsuga menziesii). The mycelium expanded on agar at a moderate rate (1 cm/week diameter at 65°F) as a loose and uneven disc of fuzzy white hyphae (Fig. 6). After growing to fill the dish, the mycelium became dense and bright white, exuded brown droplets on its surface, and then turned brown and tough (Fig. 7). These drops appeared watery not milky or opaque, and lacticiferous hyphae were not observed in the growing culture. Mycelium transferred easily onto sterilized grain, then onto sterilized sawdust (20 parts), supplemented with wheat bran (4 parts), millet (1 part), and yeast (1 gram/gallon). After eight weeks, knob-like structures, 2-4 cm diameter formed, from which fan shaped fronds emerged (Figs. 8-10). The knob-like structures may be attempts at forming a rooting base or sclerotium, from which Bondarzewia is known to develop (Gilbertson and Ryvarden 1986, Arora 1986, Trudell and Ammirati 2009) or these may be an early stage of fruiting. Noble (1948) isolated cultures of B. mesenterica from both fruitbodies and wood decay samples. To date, no mycorrhizal roots have been identified as Bondarzewia. A study of stable isotope ratios used to determine nutritional strategies for forest fungi included a sample of B. mesenterica and found it had a carbon isotope ratio consistent with saprotrophy (Trudell et al. 2004). Fig. 6. Bondarzewia mesenterica mycelium growing on malt yeast agar after 2 weeks. Fig. 7. The same after 6 weeks. Fig. 8. B. mesenterica growing on supplemented sawdust in polyethylene bag forming knob-like structures. Fig. 9. B. mesenterica forming young fronds. Fig. 10. Cross-section of a frond of B. mesenterica in vitro. While Bondarzewia causes decay in wild forests, it should not merely be considered a disease or pest. Increasingly, saprotrophic decomposer fungi are appreciated for their ecosystem benefits and for medically useful compounds. Other decay causing “polypores,” such as species of Ganoderma, Trametes, Phellinus, and Fomitopsis, as well as the spine-fungi, Hericium erinaceus and Hericium abietis, produce therapeutic compounds (Hobbs, 1986, Stamets 2005, Halpern 2007). One metabolite, Montadial A, has been isolated from Bondarzewia mesenterica. Montadial A exhibits potentially therapeutic cytotoxic properties (Sontag et al. 1999). 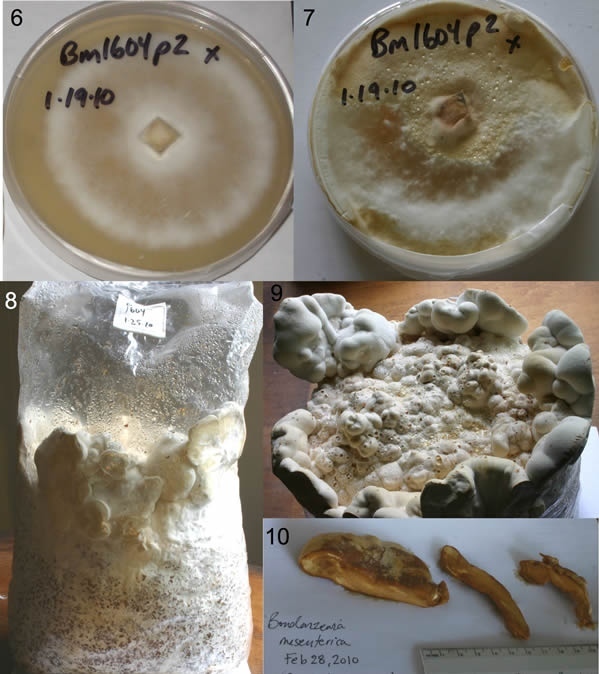 For now, Bondarzewia and many other genera remain underexplored by both culinary markets and mycomedicinal prospecting, the science and business of investigating fungi for valuable therapeutic compounds. This is a long and expensive process requiring extensive research and testing, following laws as well as scientific methods. Some fungi like maitake, shiitake and lion’s mane have both culinary and therapeutic value. When young, the cultivated Bondarzewia mesenterica has a delicate pore layer and when sautéed in olive oil with onions, garlic and thyme, it is robust and succulent; in my opinion, B. mesenterica may even be the culinary equal of maitake. Bondarzewia mesenterica is listed as a sensitive species by the Forest Service and Bureau of Land Management (FEMAT 1993, Castellano et al 1999). If it were to become a popular edible mushroom, cultivation would minimize impacts on the genetic richness of remaining wild populations and would be preferable to collecting wild Bondarzewia for markets. Cultivation would also minimize variation in quality, freshness, and bitterness. If appropriate for market production, techniques would need to be developed for production efficiency and other considerations such as texture, flavor and shelf life. Helpful comments were received from Scott Redhead, Matt Trappe, Jim Trappe and Darlene Southworth who along with Dave Oline, the SOU Biotechnology Center and the Southern Oregon University Biology Department, provided facilities and materials to support this project. 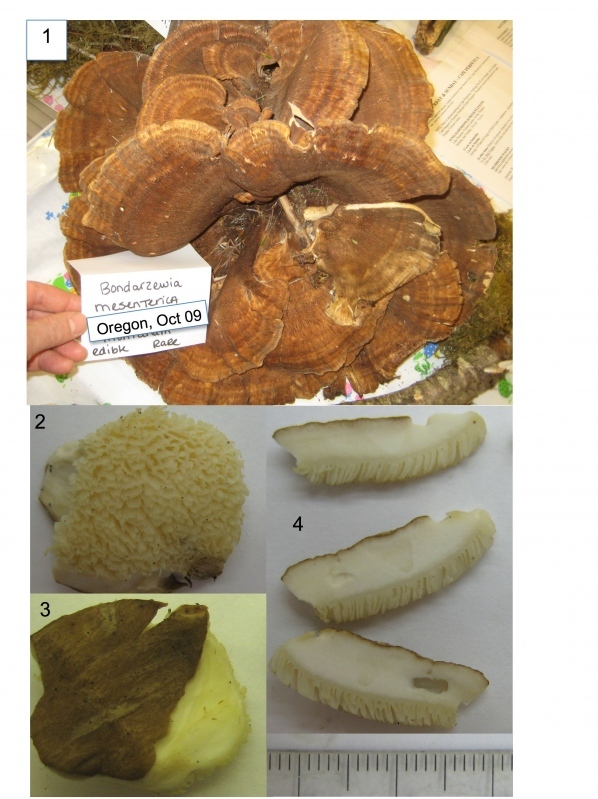 The Yachats Mushroom Festival provided specimens for observation; also Jake Hurlbert, Bruce Waugh and Louis Jeandin. 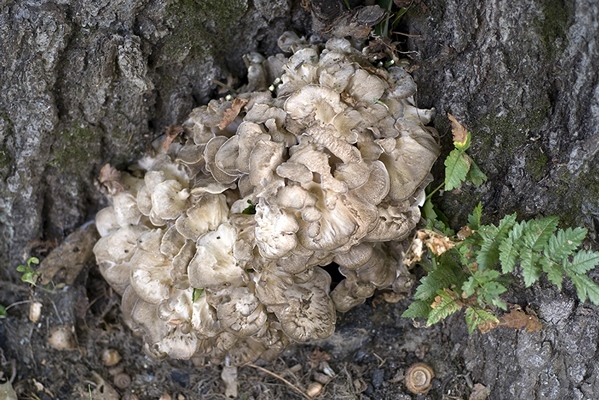 Jamie Solomon provided the image of Grifola frondosa from Maine. Arora, D. 1986. Mushrooms Demystified, 2nd ed. Ten Speed Press. Berkeley, CA. 959 pp. Castellano, M. A., Smith, J. E., O’Dell, T., Cázares, E., and Nugent, S. 1999. Handbook to strategy 1 fungal taxa from the Northwest Forest Plan. Gen. Tech. Rep.PNW-GTR-476. Portland, OR. U.S. Department of Agriculture, Forest Service, Pacific Northwest Research Station. 195 p.
Dai, Y., Cui, B., and Liu, X. 2010. Bondarzewia podocarpi, a new and remarkable polypore from tropical China. Mycologia 102 (4), 881-886. Forest Ecosystem Management Assessment Team (FEMAT). 1993. Forest ecosystem management: an ecological, economic, and social assessment. Portland, OR. U.S. Department of Agriculture; U.S. Department of the Interior. Gilbertson, R.L. and Ryvarden, L. 1986. North American Polypores Vol. 1. Fungi Flora, Oslo. Halpern, G.M. 2007. Healing Mushrooms. Square One. Garden City Park, NY. 182 pp. Hobbs, C. 1986. Medicinal Mushrooms. Botanica Press. Santa Cruz, CA. 251 pp. Kreisel 1984. Beitrag zur Nomenklatur einiger Groβpilze II. Feddes Repert. 95(9-10): 699-700. Miller, S.L., Larsson, E., Larsson K.H., Verbeken, A., and Nuytinck, J. 2006. Perspectives in the Russulales. Mycologia 98:6, 960-970. Nobles, M. K. 1948. Studies in forest pathology VI. Identification of cultures of wood-rotting fungi. Can. Jour. Res., Ser. C, 26: 281-431. Redhead, S.A., and Norvell, L.L. 1993. Notes on Bondarzewia, Heterobasidion and Pleurogala. Mycotaxon 48, 371-380. Shernoff, L. 2009. Easy Edibles: Hen of the Woods. Mushroom: the Journal of Wild Mushrooming 27: 102: 19-20. Singer, R. 1940. Notes sur quelques Basidiomycètes VI. Rev. Mycol. 5: 3-13. Sontag, B., Arnold, N., Steglich, W. and Anke, T. 1999. Montadial A, a Cytotoxic Metabolite from Bondarzewia montana. J. Nat. Prod 62, 1425-1426. Stamets, P. 1993. Growing Gourmet and Medicinal Mushrooms. Ten Speed Press. Berkeley, CA. 574 pp. Stamets, P. 2005. Mycelium Running. Ten Speed Press. Berkeley, CA. 343 pp. Stamets, P. and Chilton J.S. 1983. The Mushroom Cultivator. Agarikon Press. Olympia, WA. 415 pp. Trudell, S., Rygiewicz, P.T. and Edmonds, R.L. 2004. Patterns of nitrogen and carbon stable isotope ratios in macrofungi, plants and soils in two old-growth conifer forests. New Phytologist 164: 317-335. Trudell, S. and Ammirati, J. 2009. Mushrooms of the Pacific Northwest. Timber Press. Portland, OR. 349 pp.